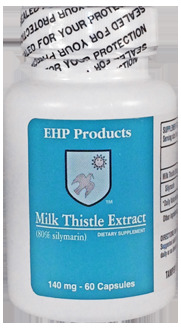 EHP's Milk Thistle Extract capsules contain 140 mg of fresh, potent, standardized milk thistle extract. There are 112 mg of silymarin complex within the 140 mg of milk thistle extract. Myristin® may be more readily absorbed if taken in conjunction with milk thistle extract. Two capsules of milk thistle three times daily with meals for ten days are recommended before starting to take Myristin®. Many healthcare practitioners think that concurrent use of milk thistle extract with Myristin® may also be helpful. For concurrent use with Myristin®, one milk thistle extract capsule with each Myristin® softgel is recommended.